Tonight Jenny and went to go see Rob Schneider at the D.C. Improv. So far everyone I told about we were going seemed rather unimpressed. 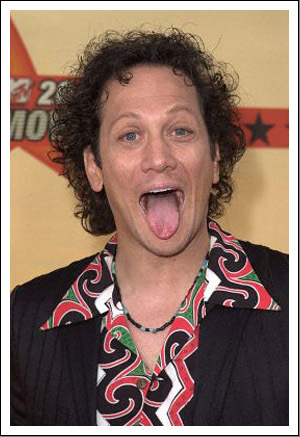 The comment I liked the most was that Rob Schneider was only good at making other people look funny. While true he is good at that, he was great live. He did a long set which was nice since he was who I was paying to see. It took him a few minutes to warm up, but once he got going, he was really funny. Totally worth the $25 for the ticket. Beyond the comedy, the thing I remember is that he was really doing what people wanted. Unlike some other comedians, he got up on stage and gave us the "You Can Doooo It" voice a few times along with several other of his more famous lines. He has gt to be sick of those, but he gave us what we wanted. He also told a great story about "You Can Do It" which you'll have to see him to hear, but in any case, he does a great Adam Sandler impression. Another expected bonus was that after the show, he came out to the front of the house and signed autographs. Although he was selling shirts that he would sign, I believe he was signing other things and talking to people for no charge. For a guy who has been a celebrity for so long, it is nice to see that he remember who pays him. BTW, he is really short. The Jeff Dunham Show is as Bad As it Sounds. According to Comedy Central, The premiere of the Jeff Dunham show had record ratings. I'm really curious how the second show does. There was nothing else on tonight so I watched a few minutes of the show. It would be mediocre for a comedy special (I'm just not sure that ventriloquists translate well to TV) but I just can't see how this will survive multiple shows. It really is the same gimmick over and over again. Face it if Brooke Hogan is your guest "star" then you have some problems. It is pretty amazing how Comedy Central promotes things. They do a great job of building up interest for something before it premieres. However, the trend seems to be the more Comedy Central build something up, the worse (and more short lived) it will be. Well, at least the pain will be over soon. Last night, I stayed up to watch the season premier of SNL (normally I DVR it and watch it on Sunday so I can fast forward through the crappy musical guests). Over all the episode was a dud. U2 sounded good (except for Bono who sounded terrible) and Megan Fox just isn't funny. However, there was one bit of excitement, one of the new cast members, Jenny Slate dropped the F-bomb during one of her sketches (a clip is embedded below until it gets yanked from YouTube). On the positive side, the sketch wasn't very good so I'm not saddened by the fact we will probably never see it again. 1) It aired at 12:40. How many people watching this had never heard this word? Were you really watching this with your six year old kid? If so I would probably be more offended by Keenan Thompson's "Grady Wilson's Burning Up the Sheets" that was disturbing. 2) Why is the F-Bomb bad but Freakin' ok? Don't words just express an idea? Isn't the idea and the meaning what is offensive, not just the sounds the mouth makes? Sounds a bit ridiculous to get worked up over this. Well I lost on the HD-DVD vs. BluRay war. Enticed by a free copy of Heroes Season 1, I bought a HD-DVD player for my X-Box 360 last year. There is no need to argue about who should have won since the battle is over, but I just feel ripped off by the supporters of HD-DVDs. I purchased high quality version of movies what I won't be able to use and they have done nothing about it. Warner is offering an exchange program of sorts. For $5 per disk and the original HD-DVD insert, you can get BluRay version of the movies you already purchased. The full details can be found on the Red2Blu web site. While I'm not thrilled about buying something I already own, at least I don't have to pay full price. WB is still making money off me but at least I don't feel completely ripped off. Now the interesting thing is that I don't have a BluRay player and I'm not sure I'm getting one any time soon. Luckily I know some people who do so perhaps these will just be cheap Christmas presents. Over the past couple of days I have been working on my computer a lot. In the past I have typically turned on the TV and had that playing in the background since the channels I often watch show repeats through out the day I decided to listen to some music. I have thousands of MP3s but I haven't purchased much new music lately so those are starting to get old. As a change of pace, I thought I would try out an online service. I have heard good things about Rhapsody from Real. I thought about giving this a try since they do have a free trial, but since for the next couple of months of months I'm still a starving student, I was a bit turned off by the $15 or so the service normally costs. I'm not sure who told me about Pandora Radio (I think it was my wife) but I started using this and it is GREAT. Pandora is a FREE radio station (kinda). It is custom radio, you can seed it with an artists name or style or even a certain song and then it references the Music Genome database and finds similar artists. This method is amazing, especially for finding new artists. I put in one of my favorite groups, Reel Big Fish, as a trial. The first song is played as an RBF song and then it followed up with 4 or 5 songs from various groups all of which I liked (and owned) and then it played a song from a group that I have never heard of. Importantly, I liked the song. The downsides to Pandora include not being able to rewind or repeat a song as well as not being able to select a specific song (that is how they are able to license the music as "radio" instead of digital music). However, you can skip several songs per hour and you can have a seemingly unlimited number of radio stations you create so if you don't like something, you can switch with a click. While I still like Pandora, yesterday I wanted to hear a specific song and I remember a service that a friend of mine at school told me about a couple of weeks ago, LaLa.com. I have a new favorite music service. LaLa lets you listen to almost anything for free. (However you do need to register with them). You can add 50 free songs to your list of songs you can listen to any time, as many times as you want but you can also listen ANYTHING once. The selection is amazing. Yesterday I was able to listen to Hindemith's Symphony in B♭ for Band and Youngblood Brass Band's "The Movement" within seconds of each other. LaLa appears to have a much better selection than Pandora but since I can't select a specific song on Pandora, I'm not positive about that. The real topper about LaLa is that it has "LaLa Music Mover" this application searchs your computer for MP3s and then compares that to LaLa's catalog of music. Any matches it finds (which appear to be pretty much anything except for some of my Drum Corps recordings) are automatically added to your LaLa collection allowing you to then play them anywhere you can connect to the web without physically taking all the MP3s with you. Finally a service that understands I already own this music and shouldn't have buy it again. LaLa also has MP3s for purchase for competitive prices (I've seen 79 to 99 cents) if you down want a copy for your portable device. Overall, I highly recommend Pandora for stream music that doesn't stop with very few ads (maybe 10 seconds per hour) and for finding new artists that appear to what you like and LaLa for everything else. Enjoy the music, I know I am. 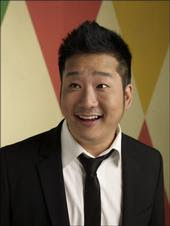 To celebrate my birthday (a week late), Jenny took me to the Improv last night to see Bobby Lee. The host for the night was horrible so I was a bit concerned, but the featured act was ok. At least he was much better than the host. Once Bobby got up on stage, it was non-stop laughter. He was hilarious. Although I've never been a fan of MadTV, it is obvious to see that he is one of the reasons it survived so long (although it was apparently canceled). According to his MySpace page, Bobby is a year and half older than my brother and we all went to the same high school, so I need to check in with my bro to see if he remembers Mr. Lee. Two weeks ago, we went to see John Heffron who was great, but Bobby was painfully funny. It really hurt after he was done, I haven't laughed that hard in a while. Bobby Lee is playing again tonight and tomorrow in Pittsburgh. If you are in town, I highly recommend it. This page took 0.983 seconds to load.